I recently wrote a post about the WikiEnergy data set released by Pecan Street Inc, and have since written a downloader and converter for the data set as part of NILMTK. In total, the data set contains 71 feed feeds monitored across 239 buildings over the period 1 Jan 2014 - 31 May 2014. However, only a subset of feeds were monitored for each building, and many buildings were not monitored for the full 5 months. This post provides a bit more insight into the content of the data set at the time of writing. 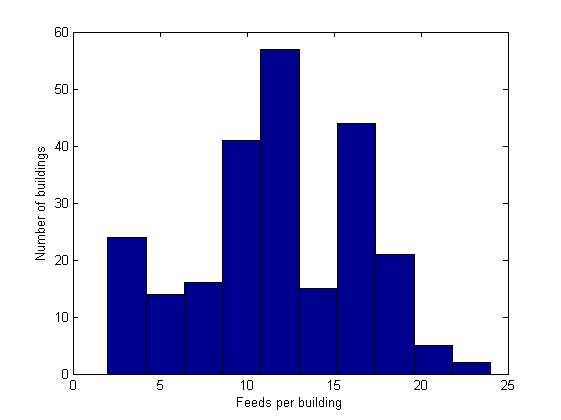 The histogram below shows the number of feeds monitored in each of the 239 buildings. It can be seen that the mode of the distribution is around 12 feeds per building, and therefore most of these buildings will be useful for evaluation energy disaggregation approaches. 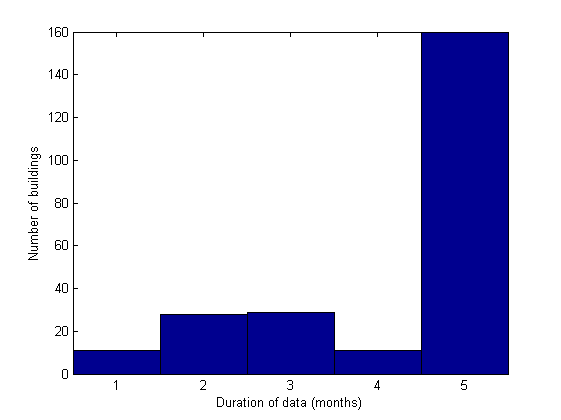 The histogram below shows the number of months for which each of the 239 buildings were monitored. It can be seen that vast majority of buildings were monitored for the full 5 months, while the remaining buildings were distributed between 1-4 months. However, this distribution will change dramatically once data for 2012-2013 is released. 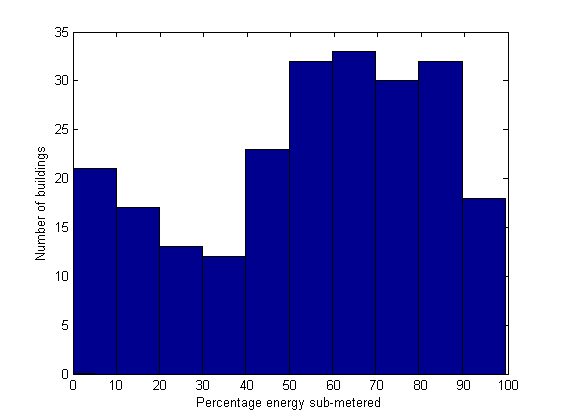 The histogram below shows the percentage of energy sub-metered in 235 of the 239 buildings. The remaining 4 buildings appeared to have energy sub-metered greater than 100%, and were therefore excluded from this plot. This distribution has two distinct peaks; one centred around 70% and another which peaks around 5%. The 63 buildings for which less than 40% of the energy was sub-metered are likely to be of limited use for evaluating energy disaggregation methods. The table below shows the number of buildings in which each of the 71 feeds were present. A description of each of the feeds is available from the Wiki-Energy Knowledge Base. It can be seen that the presence of feeds in buildings is quite sparse. However, the following feeds are present in the majority of buildings: the household aggregate power (use), air conditioning (air1), washing machine (clotheswasher1), dishwasher (dishwasher1), clothes dryer (drye1), electric heating (furnace1) and refrigerator (refrigerator1). How can access the database of wikienergy?